It is clear that the Sunday of Divine Mercy is a day dedicated in a particular way to the sacrament of reconciliation. Indeed, in many parishes throughout the world, it is customary on this Sunday for the priests to be especially available to hear confessions throughout the day. How great a gift we have in this most precious sacrament, by which the blood of Christ is sacramentally poured out upon us and we are washed clean of our sins. Here the Divine Mercy is most evident – for the good God accepts the prodigal and clothes him as his own son once again! Oh blood and water which gushed forth from the Heart of Jesus as a fount of mercy for us, I trust in you! However, although we know the necessity and the value of the sacrament, all of us (I dare say) have room for great improvement in making a more worthy confession. We should all continually be asking ourselves, How might I make a good (or better) confession? How might a good confession today, lead me to an even better confession in the future? Great post, and very enlightening about imperfections and penance! "May God grant you pardon and peace, and I absolve you from your sins in the Name of the Father, and of the Son, and of the Holy Spirit." "I absolve you from your sins in the Name of the Father, the Son, and the Holy Spirit." "God, the Father of mercies, through the death and the resurrection of his Son has reconciled the world to himself and sent the Holy Spirit among us for the forgiveness of sins; through the ministry of the Church may God give you pardon and peace, and I absolve you from your sins in the name of the Father, and of the Son and of the Holy Spirit." "Through the death and resurrection of the Son he has reconciled the world to himself, and I absolve you from your sins in the Name of the Father, and of the Son, and of the Holy Spirit." "May the Lord open your heart to his pardon and mercy, and through the ministry of the Church I absolve you from your sins in the Name of the Father, and of the Son, and of the Holy Spirit." "God, the Father of mercies, through the death and resurrection of his Son has reconciled the world to himself and sent the Holy Spirit among us for the forgiveness of sins; through the ministry of the Church may God give you pardon and peace, and I absolve you from your sins in the name of the Father, and of the Son and of the Holy Spirit." [almost identical to the way you wrote it, but no second "the" in "through the death and resurrection of his Son..."
The essential words are: "I absolve you from your sins in the name of the Father, and of the Son, and of the Holy Spirit." If the priest goofs and says: "I absolve you of your sins" it would still be valid. It is likely that the priest could even forget to say "from your sins" all together -- "I absolve you" may be enough. Also, it seems that the Trinitarian formula is not strictly and absolutely necessary for validity. Still, priests ought to say it right ... and the penitent should feel free to GENTLY and HUMBLY correct the priest (after the prayer) is there are any errors -- this correction must always be given in a true spirit of CHARITY. Yesterday, in preparation for Divine Mercy Sunday, I went to confession. I am still reeling from the experience. All week long I read about how Our Lord is all love and mercy, and all I received yesterday from the priest was coldness and harshness. I was taught to always mention a previous mortal sin in the confessional if you had not committed any since your last confession (e.g. "For these sins and all the sins of my past life, especially the time I stole $10,000 from my mother, I am very sorry."). Yesterday I was accused of having no faith, wasting the priest's time, making a mockery of the sacrament etc. etc. for doing this. I've been doing this for over fifty years. Is it wrong? Now I understand why people who this happens to never go back to confession. Even I am "gun shy" now of returning to the confessional. Do not be the least bit discouraged! Christ knows your heart and he knows the heart of that priest. What you have done is good and right ... if you can find a different confessor, that may be advisable. If you must continue to go to the same priest, you may need to modify your style of confessing so as to avoid further trouble with him [it is too bad that the sheep have to accommodate themselves to the shepherds...]. Still, do not let this bad experience discourage you ... that is what Satan wants! The Lord desires that you trust more and more in him -- his grace will be enough and will work even through us poor priests. Thank you, Father. I just wanted to add that he is a very good and solid priest. I don't know what went wrong yesterday, but Our Lord allowed it to happen for my own good. Still, it was an unsettling experience. Please say a prayer for me that the Holy Ghost enlightens me as to what that good might be. Excellent post Father. In the light of some of the comments, might you consider a future post on how one might be a good confessor? 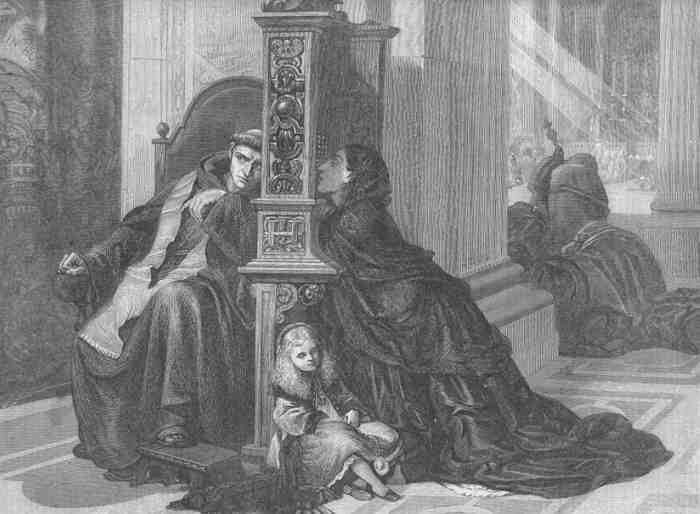 A reader noted the following point from the Catholic Encyclopedia: "Satisfaction is not, like contrition and confession, an essential part of the sacrament, because the primary effect, i.e., remission of guilt and eternal punishment — is obtained without satisfaction; but it is an integral part, because it is requisite for obtaining the secondary effect — i.e., remission of the temporal punishment." It is true, satisfaction is not necessary in the same way that contrition and confession are necessary, but it is integral and it is required. 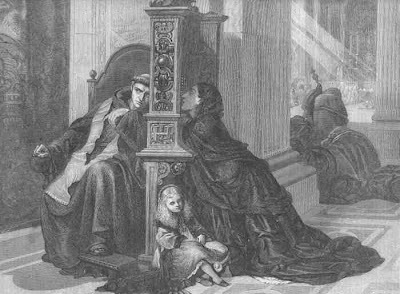 The same article ("Reconciliation") of the Catholic Encyclopedia states: "An undeniable proof both of the practice of confession and of the necessity of satisfaction is found in the usage of the early Church according to which severe and often prolonged penance was prescribed and performed." And, stressing the necessity of satisfaction, the article recalls that Trent required the confessor to impose some penance upon the penitent. Again: "The sacrament as such and on its own account has a matter and a form and it produces certain effects; the power of the keys is exercised by a minister (confessor) who must possess the proper qualifications, and the effects are wrought in the soul of the recipient, i.e., the penitent who with the necessary dispositions must perform certain actions (confession, satisfaction)." Finally, satisfaction is considered by the theologians (and by some Popes) to be part of the proximate matter of the sacrament (the form being the words of absolution): "According to St. Thomas (Summa Theologiæ III.74.2) 'the acts of the penitent are the proximate matter of this sacrament'. This is also the teaching of Eugenius IV in the 'Decretum pro Armenis' (Council of Florence, 1439) which calls the act's 'quasi materia' of penance and enumerates them as contrition, confession, and satisfaction (Denzinger-Bannwart, 'Enchir. ', 699). The Thomists in general and other eminent theologians, e.g., Bellarmine, Toletus, Francisco Suárez, and De Lugo, hold the same opinion. According to Scotus (In IV Sent., d. 16, q. 1, n. 7) 'the Sacrament of Penance is the absolution imparted with certain words' while the acts of the penitent are required for the worthy reception of the sacrament. The absolution as an external ceremony is the matter, and, as possessing significant force, the form. Among the advocates of this theory are St. Bonaventure, Capreolus, Andreas Vega, and Maldonatus. The Council of Trent (Sess. XIV, c. 3) declares: 'the acts of the penitent, namely contrition, confession, and satisfaction, are the quasi materia of this sacrament'." In other words, the intention to fulfill the penance (satisfaction) which the penitent accepts from the priest is both necessary and integral to fruitful reception of the sacrament. I'm not sure when ... it will be bit more involved, since the topic is of such great importance and the matter is so sensitive --- what is of greater importance than directing souls? Every soul is a spiritual universe, worth more than the whole material world together! In the meantime: I would recommend the parts on confession from Alphonsus Liguori's book "Selva" or "The Dignity and Duties of the Priest" as well as the relevant portions of St. John Eudes' book "The Priest, His Dignity and Obligations" ... to me, these two books are spiritual gold-mines. They will guide you through nearly every aspect of priestly life. Certainly, Garrigou-Lagrange's book ("The Priest in Union with Christ") and also that by the Opus Dei priest Federico Suarez ("About being a priest") are modern books which deserve special note -- but don't run too quickly to the modern authors, there is much to be gained from the older writers first. Peace to you, good father! Pray the good Lord that all priests may become good and holy confessors ... to this end, we must strive forward in the interior life. This post was more helpful than the "10 Commandments" guide to examination of conscience which is not, usually, very helpful to me as far as discernment goes. My I suggest you develop this post & send it Homiletic & Pastoral Rvw for publication? Might include your thoughts on 'how to be a good confessor'. peace! TO ALL: It may be worth noting that, while contrition is absolutely necessary for a valid confession, the actual confession of sin and satisfaction is necessary in a slightly different sense. Contrition implicitly contains confession and satisfaction -- since, if we are truly sorry, we want to confess and to make amends for our wrongs. Thus, if one is contrite, but is unable to actually confess to the priest and perform satisfaction (for example, if a man is dying and is unable to speak), his contrition includes a virtual confession and satisfaction and the priest ought to absolve him. It is for this reason that true and profound contrition, which comes from love, is most necessary to a good confession. Excellent - Thank you for this beautiful post. I have a very hard time wondering if my confession is ever good enough. The contrition and grief of the sin is true, but it is so hard to rid myself of the guilt. How specific does the confession need to be? When one says , for example, that they have hurt others because they were jealous of them, do they have to say exactly what they did to hurt others? Please advise. We must learn to be free from sentimentality -- little by little we are ruled less by our emotions and more by our reason. Thus, while our contrition and grief increase, any sense of oppressive guilt will be diminished. Be patient with yourself, trust your confessor (if he is a good priest) and, especially, speak with the Lord in prayer. Regarding the specificity of sins confessed -- if it is not a mortal sin, the requirements are much less. I think something like this would usually be enough -- "Father, I have hurt others (and we should say either through speech or action, or stealing or physical harm, etc.) because I was jealous of them (either of what they possess or of their reputation or of their friendships or of their holiness, etc. ), and I have done this many times (or few times or once) to many people (or to a few people or to one person or to my brother/husband/sister/wife/mother/father/family, etc.)..." This is one of the best articles I have read about making a good Confession. It is not that the others weren’t any good (they were good) but this one is much more practical and specific. Just reading it made me much more aware of what I need to do not just when going to Confession but also in spiritual growth. However, there’s one thing that bothers me. A couple of years ago I went to Confession after a very long time. During that time I had been away from the Church but God’s grace brought me back again. Making that Confession was not easy. Did I make a laundry list? Yes. (That was the only way I felt sure that I would confess all my mortal sins.) Did I give a lot of detail for each of my mortal sins? Did I give enough information about number? Well, it was difficult to be precise and to solve the problem I just said ‘many times’. Because that ‘many times’ is rather vague, I have been having doubts that I made a valid confession but a priest I consulted was very forthright in telling me that I was not to doubt that my sins were forgiven. But reading your article has got me worried again. I have a question (and this might have some bearing with regard Veronica's comment). I was told, when much younger, to be careful not to be scrupulous. And to trust that when a sin has been confessed and absolved, it is forgiven. As an aside, at the of confession I will add "and for all those sins I cannot now bring to mind". Thank you for your kind encouragement. Perhaps I will publish some version of this at some point ... in any case, I am very happy to hear that this little reflection has been helpful. I realized that my post of April 30 (8:07pm), though stating I had a question, was not in the form of a question. Since college days I have tried to visit the sacrament of confession regularly -weekly, if possible. While trying my vocation as a Dominican (I love those guys!) I was counseled not to be so scrupulous in my confession. My question to you then, is how does one find the balance? (again, following up on Veronica's post). As an aside, at the end of my confession I will add "and for all those sins and failings I cannot now bring to mind". Thank you for drawing my attention to your question! First, it is not necessarily scrupulous to mention sins which have already been forgiven, so long as we are clear that they have indeed already been forgiven. Second, nevertheless, it can happen that a priest may advise a penitent not to bring up a particular past sin (generally requiring silence on the point for only a certain length of time, not forever). Third, the best way to learn to make a good confession is to find a good confessor. He can guide you on personal points more clearly. Scrupulosity can mean several things -- generally, it is when we think a action is more sinful than it really is: To think an imperfection is a venial sin, or to think a venial sin is a mortal sin. Sometimes, "scrupulosity" is also used to refer to the thought that a particular sin is so bad that it cannot be forgiven. Hence, there are two ways to cure scrupulosity -- if it is an error in judgement (thinking a venial sin is mortal, etc), then we need to be educated; and a good confessor will teach us the truth. If it is an error in hope (thinking that a sin cannot be forgiven), then we need to be convinced of the Divine Mercy and the love of God -- here, prayer is essential; meditating upon the Cross, how could anyone despair? So, to answer your question: "How does one find the balance?" Prayer is essential, and a good confessor is also a great help. If a good confessor cannot be found, then prayer will suffice (together with study of good Catholic resources on confession). Many thanks for taking the time to answer my question -and for answering it with such care and compassion. It has been difficult finding a good confessor since leaving the Dominicans (in good standing; Sadly, just not O.P. material). I have, thank God, been blessed these past three years (after nearly 6 yrs of hit and miss), to have found a good confessor. As for your advice to study good Catholic resources on confession, well, your article is the best treatment on the subject I have seen in a very long time. May God continue to bless you, and your every endeavor! Dear Father, thank you for a wonderful post. You do a most needed work of charity and for that God must be praised! May the Good Shepherd, through the almighty intercession of the Most Blessed Virgin, grant you many years of service to the Church and an everlasting reward in Heaven! I was wondering about the "fullness" of contrition. I was under the impression that one strictly only needed contrition for mortal sins committed to receive valid absolution, but now that I read your post it seems like we need true contrition for all sin whatsoever and that this is a strict requirement for validity. I don't think I have a personal problem with this at the moment, Deo gratias, but since I have a guide to confession on my blog it would be most helpful to correct any error I might have relayed there and elsewhere. Dear Father. I researched the question a little by checking some of the catechisms of old. "Q. 759. What do you mean by saying that our sorrow should be universal? A. When I say that our sorrow should be universal, I mean that we should be sorry for all our mortal sins without exception." "51 Q. What is meant by saying that sorrow must be universal? A. It means that it must extend to every mortal sin committed." So I guess I have the answer to my question. Thank you anyway. It is true that we need only have actual contrition for every mortal sin of which we are conscious. This is why we often say: "For these and all my sins, I am heartily sorry." So, if someone were specifically obstinant in sin -- even venial sin -- and was explicitly NOT sorry for that sin; they would lack contrition. Confession forgives every sin committed -- God can't forgive one mortal sin and leave another; nor can he forgive one mortal sin and leave behind even a venial sin. Thus, as you quote from Pius X and the Baltimore Catechism -- contrition must explicitly and actively extend to all conscious mortal sins; but by its very nature it also extends (at least implicitly) to every venial sin. I was thinking about this and I have a question. I hope I'm not nagging on you now. But let's say we have no mortal sins on our soul when we die but nonetheless unrepented venial sin, we would go to Purgatory to be purged of our unrepented venial sin, no? But how does this relate to what you are saying here? Basically, would we go to Hell if we obstinately hold on to even to one venial sin, let's say deliberate idle talk, in our moment of death? But if that is not the case if we are in a state of grace at death, why would it be the case that we have to be truly contrite for venial sin, even if implicitly and potentially, in order to receive valid absolution of mortal sins committed? David (hilaron), You are asking really really good questions ... and are helping me to really think this issue through! So, thank you! The point about contrition is that, by its very nature, it either extends to all sin or to none -- even imperfect contrition is sorry for all sin, since all sin has merited hell (even venial sin, though not directly). Especially perfect contrition is sorry for all sin. Hence, it would seem to me that if a person died without any contrition (even imperfect) for venial sin -- he would be thereby failing in final perseverance, and would be committing a mortal sin. However, the general, implicit, potential, and imperfect contrition for all sin is enough to get to purgatory -- where contrition is perfected. You see, God just won't forgive our sins if we are not sorry for them. And he won't forgive mortal sin without forgiving venial sin. Therefore, it seems to me that we simply have to have some level of contrition for venial sin (at least generally). So, to the question "would we go to Hell if we obstinately hold on to even on venial sin?" -- It seems to me that obstinately holding on to sin (actively turning from God toward sin, even venial sin) becomes a mortal sin at the moment of death, when we are meant to turn to the Lord with particular love and devotion. Now, I am not saying we need to be perfect -- I'm only saying that, at the moment of death, we need to at least desire to be saints (this means desiring to be free of all venial sin, even idle talk). Simply that general desire to be a saint, to go to heaven, to become perfect in the Lord -- this is already that imperfect, general, implicit contrition for each and every venial sin. Does this make sense to you? Your questions have really helped me to think this issue through a lot! So please let me know if there is something I am missing here. I think where you are getting at. There is still room for a somewhat complacent contrition (implicit and potential, as opposed to actual) in regards to venial sins as I understand you, but that in our heart of hearts we want to be freed from those as well. I had quite a lot of problems with scruples (and still have the occasional relapse) and then I read lots on how to discern sins and so on. I learnt then a principle that some action that objectively is not grave matter can still be the object of a mortal sin. Say I shoplift a chewing gum for 50 cents, that's not grave matter in itself (although intrinsically evil of course) but the desire to offend God in such a circumstance can be grave matter and thus the action can be a mortal sin on account of my evil desire. I think I understand that the principle is similar here. If, in the moment of death, I actively and obstinately won't let go of venial sin it can (and probably will) become the object of grave sin since my desire is quite perverse: to turn away from God. If I'm that attached to something other than God it would probably become mortal to the soul.